Supporters of single-payer health care attend a speech by Vermont Senator Bernie Sanders in Washington. More than half of House Democrats have backed the idea. And one-third of Senate Democrats are on board with some version of it, too, including presidential hopefuls Elizabeth Warren of Massachusetts, Kamala Harris of California, Cory Booker of New Jersey, and Kirsten Gillibrand of New York. What long felt like the tired dream of a dying American left is now very much in vogue. So Ideas leapt at the opportunity to chat with one of the world’s leading experts on single-payer: Sir Malcolm Grant, who recently stepped down after seven years as chairman of England’s National Health Service. Grant, a genial character with a salt-and-pepper mustache, was in town to speak at Brigham and Women’s Hospital and Harvard University about single-payer. And he arrived just as his former agency released a much anticipated long-term plan, which laid out some ambitious goals for the future of medicine. The underlying premise — that a single-payer system could also be a hotbed of medical innovation — runs counter to many Americans’ expectations. But in Grant’s telling, the centralized policymaking and data collection of Britain’s National Health Service are significant assets in applying new technology. Ideas sat down with him at a friend’s office at Harvard. The interview has been edited and condensed. 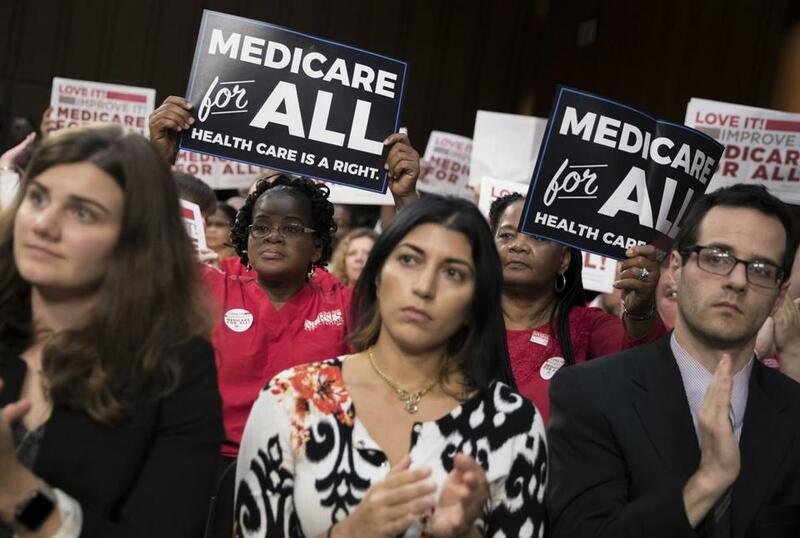 Despite the new push for Medicare for all, Americans have long been skeptical of single-payer health care. So convince us. What’s your elevator pitch? I think every health care system in the world has spectacular levels of waste, and a lot of the waste in the United States is a consequence of multiple payers. We have been able, in the United Kingdom, to reduce the proportion of our administrative costs in the National Health Service to about 3.5 percent of total spend. I don’t have an equivalent figure for the US, but I would figure it’s considerably greater. Yes, it is — 30 percent, by one estimate. There are also obvious counter arguments to [what I’m saying] — potentially, [single-payer] reduces choice. But the counterargument to reduction of choice is the reduction of inequity. Within the UK, nobody is ever bankrupted by health care costs. What do you make of the surge in American interest, at least on the left, in single-payer? It’s fascinating. You can conceive of a single-payer system in terms of an immensely strong moral purpose. The community will spread risk — financial risk — across the entire community, and recoup it on a progressive taxation system. That’s the starting proposition. One of the consequences of that in the United Kingdom is that, on every survey of public opinion, when people are asked, “What is the institution that you trust most?,” the National Health Service is right at the top. It’s ahead of the monarchy, the judiciary, the BBC — I mean all of these are very trusted institutions. But it’s because everybody’s life has been affected by it, and although it is often dysfunctional, struggling to maintain high quality, struggling to maintain the equality of access across the entire country that we would want, nonetheless, it’s a symbol of a post-war sense of solidarity, which no government ever would seriously consider dismantling. Are you skeptical that we’ll ever get to single-payer system like that here in the United States? I don’t see there being a unifying force in the US that would be sufficient to bring political consensus around a single-payer system. Were it to develop, then it would develop at a local government level, potentially at a state level. When you say we lack a “unifying force,” what do you mean? This is a more individualistic country, with a very deep distrust of government. You’ve suggested that a single-payer system can help prevent overmedicalization and overtreatment. How do you sell that to an American public, or even a British public, who might fear rationing of care? Every health care system in the world has rationing. In the United States, I would be rationed by the insurance policy that I was able to afford. And beyond that, I’m rationed by how much I can afford, personally, for out-of-pocket. Alongside that is the important question of how much we pay for drugs. We have a mechanism in the UK for holding down that cost. Principally, we do a cost-effectiveness evaluation. So, when a drug is coming through the market, it’s tested first of all for safety and for efficacy, and for impact across the population. And then we do a further test: Is it actually cost-effective? That gets to the heart of what you’ve described as rationing. Would you rationally spend $1 million on a drug whose prospects of improving the outcomes for this patient were, let’s say, 10 percent, and has only been proven to have an impact for six months? That’s the sort of decisions we have to take, and we take in the aggregate — and they’re taken by clinicians, who then of course are also thinking, well, how could that money be better spent in the system to a greater effect? If you look at the three countries in the world who have access to the most innovative drugs, it’s actually the United States, United Kingdom, and Germany. People often assume that a single-payer system has a model of rationing that you wouldn’t see elsewhere. And I would dispute that. There is a limit to what we can afford. I’m not sure there is any country in the world, at the moment, that has a financially sustainable system of health care into the future. Certainly not the United States. You’ve also suggested that single-payer health care can be a means of cutting down on medical and surgical specialties. Why should we want such a thing? We’re actually able to, through a single-payer system, hold people to account — to draw attention to the variation [in treatment approaches and costs], and to take out significant cost across the system. We’ve been moving into an era of much, much more specialization. The disadvantage of that has been that we have lost sight of generalists, of people who can look at all aspects of the condition of the patient. And it’s not uncommon in this country, as well as in my country, for the treatment that a patient gets in a hospital to be determined by which door they walked in. For example, in cancer, is it going to be surgical, or is it going to be chemo, or a combination of the two, and how do the two work? You know, you’ve got two teams often siloed working in different directions. The National Health Service just released its long-term plan. Among other things, it says patients will have a right to a digital-first consultation by 2024. What does that mean? There’s a very strong argument that much of the future of health care rests in the digital space. Data is going to be critical to doing things that we, at the moment, do imperfectly. We’ve got a new generation now who are accustomed to accessing everything digitally. So we’ve been experimenting in the UK with a number of primary care digital products. It’s like a FaceTime consultation with a general practitioner. If necessary, show them a scar or a wound, and be given a prescription. The entire consultation [can be] held in the cloud, where the patient can go back and look at it any time. Our primary care resources are limited. People are having to wait longer and longer to see a GP, who is dealing more and more with an elderly population, with multiple comorbidities, who can’t be sorted in 10 minutes at a time. They’ve got to have longer than that. So we need to vary the caseload for GPs and try and use a digital-first model, reinforced by artificial intelligence. What difference will artificial intelligence make? In one of the models I’ve seen, on the doctor’s screen, [the computer is] saying, “Ask them about X, Y, Z.” And there’s a degree of probability of three conditions that this might be, as the interview goes on. So, one of those probabilities hits up toward 70 percent to 80 percent, and the others decline down to 10 percent or 15 percent. I mean, this is really interesting stuff. Early stages, but there’s one company in the UK that we’ve been using this with, they’ve got about 50,000 of our patients registered on it. And they’ve also now established it in Rwanda, where I think there’s a potential of stepping over the cultural norms and institutions of established nations, and going straight to a digital-first and -second model. Tell me a little bit about the long-term plan’s ambitious approach to childhood cancer. What we’re going to do with childhood cancer is offer whole-genome sequencing to every child. The NHS is currently the global leader in this. And that is potentially going to transform our treatment of children. There’s another argument running at the moment as to whether whole-genome sequencing should be automatically offered to all newborn children. Which I think is a step far too far at this stage — until we can see clarity as to what would be the benefit from that, in clinical terms, as opposed to purely research terms. Then secondly, understand what are the ethical issues which are profound in this. People often refer to the impact that may have on people’s health insurability, but beyond that, there are questions about the extent to which the genome is a reliable indicator of life course, whether people want to know that, and how valuable it is in the clinic. Whether a parent can reliably take that decision on behalf of a neonate. There are huge ethical issues that need to be thought through globally.